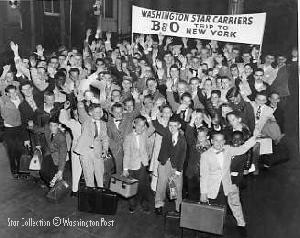 The Washington Star Collection (ca. 1935-1981) contains the photo morgue, both published and unpublished images, of The Washington Star newspaper. The Star was the paper of record from the late 19th through the mid-20th century in D.C. (eventually superseded and later purchased by The Washington Post). Strongest coverage is for the 1960s and 1970s. The collection has been kept together intact, therefore national and international images can be found as well as local D.C. Please visit our Interim Services page for information on viewing the collection. The Star photo subject guide (folder title list) is available online. Press Ctrl+F to search for your topic. You may ask reference questions by emailing wash.dcpl@dc.gov. The Washington Post purchased the physical assets of the Washington Star newspaper when it closed in 1981. In 1982, the Post donated photographs, clippings and papers of the Star to the DC Public Library. The Post retained copyright to photographs taken by Star photographers and licensed the library to grant permissions and sell reproductions to library users. Please review information about how to obtain Image Reproductions & Permissions of photographs in this collection. You can review a copy of the permission to publish form. The library does not have the rights and cannot grant permission for photos in the collection taken by wire services or other photographers. Please consult with the photo librarian on how to obtain permission to publish non-Star staff images.